Vastu Compass, Directional Instrument, Navigational instrument, Diksuchi: In olden days Vastu Consultants used to depend on the residents about directions of the property. Now a days also vastu pandits rarely bring Compass to the sites. They bank on the residents to know directions of that property. Still we observed in villages and in some towns too also numerous Vastu Pandits asking inhabitants where "Sun rises" at their property. (For some more information this link provides Directions Vastu provides.) With this circumstances, inaccuracy in finding the directions may come into mind and leads to miscalculations. Days changed, Vastu Pandits understands the fault procedures and bringing compass while visiting for vastu consultation visits. Sign of good to society. Most of the residents did not understand how to examine the actual directions of a property with the help of a compass, right here all of us may talk about much more regarding directions of the home, make sure you take notice of the beneath pictures. Residents obviously implies that the actual compass is positioned from entry doorway as well as right here you might obviously take notice of the "house inside" as well as "house outside" textual content seems because "Inside" as well as "Outside" from beneath pictures. "How to find directions with the help of compass"
for them here we provided some information below and learn. Don't miss to visit the right animated arrow at almost bottom. 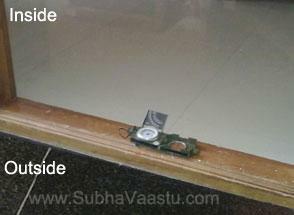 This home is in Mumbai city, one client has taken photos with placing one compass in his house primary entrance doorway which is having a verandah and the same was connecting to lounge. Here in this image, the compass is clearly placed at door step or door sill. This image helps you to understand on finding directions of a property. There is door and you may observe the "inside" and "outside" text of the house premises in this image too. He kept the compass on the door sill. Some body says that keeping the compass on door sill is not the right procedure, better to keep it on anywhere in the ground. The compass should not keep very near to the any iron. If any iron nails were used for the door sill, then compass will show the wrong direction. Some door sills has some sticking of Shani Dosha Nivaran items which made with iron etc, if there is such materials, then definitely compass never shows exact directions. Be careful in observing the directions of the property. Negligence spoils the entire vastu consultation, will get only the bad results when analization will be wrong. Check this image, this is little close up shot of the above compass, but slight angle changed when taking the photo. To understand more about finding the directions we thought to keep the few photos, so readers can understand the finding of the directions. People who has vastu knowledge feels boring by seeing these multiple ditto photos, but people do not have much knowledge on Vastu Shastra they will be more benefited by observing these different angled photos. 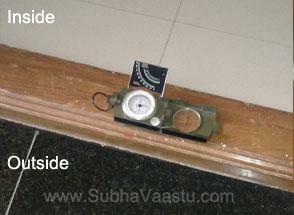 Its easier for them how to finding the directions like East, West, North or South with the help of vastu compass. In this image the navigation needles are slightly showing than the above image. Better understanding than the above one. These all images were petty bringing the material facts, but this subject is not that much easy to find out the exact directions. 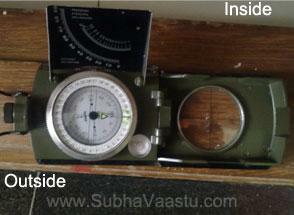 Vastu experts can easily find out the directions just by seeing the compass within seconds. Once they observed the compass, they never recheck the compass again, because they understand the directions of the property once they got the knowledge from seeing the compass once. But in many cases, few experts double check the compass while going inside of the home too. By seeing this we may not have doubt on them, this could be good for the residents. Vastu Specialists always following right procedures. Take a look at this same close up shot image carefully, it was more close-up shot, this picture is equivalent to the same above. Here it might clearly take notice of the door facing directions, finding the directions with this method of observation is applicable for site, house, factory, shopping complex etc, but should not keep the compass on the door sill, actually keeping the compass on any surface is not at all suggested, just keep the navigational compass with hand and find the directions, this is originally best practice, unfortunately most of the vastu consultants keeping compass on ground or some surface, because their understanding capacity may be not that much sound or some thing worried information may be found. Concerning with the house direction, this house faces towards East direction, this house is said to be East facing house. The primary entrance is towards East direction. We are entering into West direction and this home is facing towards East direction. By entering from East direction to West direction is called East facing home. Some states this home is West facing house, its wrong statement, this is perfectly East facing property. In Vaastu Shastra without compass we might not predict the home results, therefore the consultant always should have a compass with him. Otherwise, he never comprehends the directions of the property. Without knowing the compass or without having the compass when checking the directions. Dear Sureshji, I am trying to figure out through compass but because of electro magnetic waves it’s always showing me different direction however I figured to find it exactly thru the GPS - Karuna - Atlanta - USA. We always using traditional compass for the exact directions. 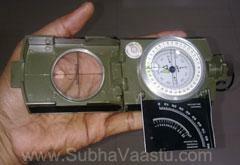 We never use any of electro compass or phone compass etc. One should know, if finding wrong about directions then all things become wrong. Be careful, finding directions is the most important aspect in Vastu Shastra. When need to check the directions of a property best to use only the traditional compass. We are using the "Engineer" Compass. How to find directions of a house? Vastu reviews, where can I check them? Which link provides us audios and videos? Which facing plot is good as per my horoscope? Vastu Purusha Mandala, what is the exact story? Vastu house plans, can I get them in this website? How can we stop heavy expenditure through vastu? Vastu consultant in Austin, how can I contact them? How can seize unhealthy habits with the help of Vastu? resp sir : i wud like to know upto what degree deviation effect of particular direction is to be counted in all 4 major n 4 minor direction. for e.g. north n east s 90 degree. deviation. at 45 degrees northeast comes. so upto wt degree north west is to b counted ? 22.5 degrees each from 45 degree line? or more or less? if some thing s say 30 degree deviated from north to east. then its to b counted as north or northeast? I have a layout map for lots that will be developed in future. I needed advice on the plot that will be good to purchase. Can I upload that layout in an email? I like to know which face I keep my mandir in my house and whatface iI have to sit for puja.please let me know.sun come out from my front door my left side cornnar when I stand face to my front door. My name is Ravikanth Borusu. My Janma Nakshatram is Chitta- Padam-1. Date of Birth 18.11.1987 @ 1.10 PM (afternoon) @ Hyderabad. I would like to purchase independent house at KAKINADA(East Godavari). Which House Facing is good for me in order of preference.